When the director gets up before the movie you’re about to see and describes his last film (the gloriously gory The Loved Ones from 2009) as a “great ad for drills”, you know that you’re dealing with someone who can have a bit of fun. 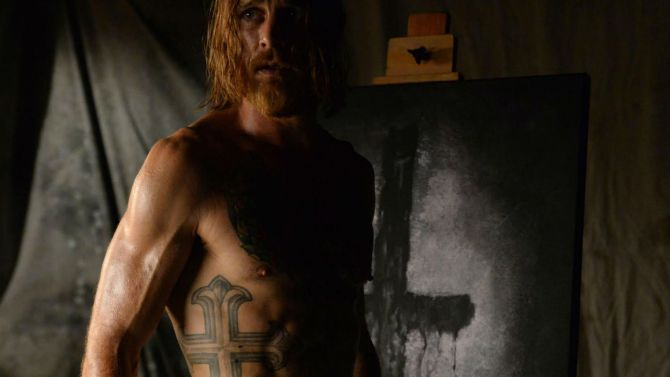 The Devil's Candy delivers and then some, thanks to an amazing soundtrack featuring drone metal legends Sunn O))), along with the likes of Slayer, Metallica and Queens of the Stone Age. This film is a throwback to a time when horror movies were simpler. There are no zombies, no vampires, no other-worldly monsters. Here we are dealing with that old man: The Devil. The devil who cannot walk this world, but can manipulate humans to carry out his evil machinations in wide and varying ways. A zombie just eats your brains...it doesn’t aim for the soul. The film opens in a Texan (read: creepy) farmhouse. Overweight and dim-witted Ray (Pruitt Taylor Vince), who has the whole ‘man-child’ thing going for him, hears a hellish, Latin-speaking voice. In order to drown out said voice, he plugs in his amp and blasts out some seriously rocking guitar riffs – because what else would you do in the middle of the night to drown out Satan’s calling? His elderly mother disagrees and oops, she’s a goner. We are then whisked away and introduced to the Hellman family (yes, Hellman, director Sean Byrne sure knows how to have some fun). Jesse (Ethan Embry) is an artist who happens to love metal, as does his teenage daughter, Zooey (Kiara Glasco). The two share a bond through music that Zooey’s mother, Astrid (Shiri Appleby) doesn’t quite get. But then, who really ‘gets’ metal, unless you’re a metal head yourself? Poor Jesse has to paint butterflies to make ends meet (“So not metal”, as Zooey puts it) and when they stumble upon an old country farmhouse with a perfect studio space at a bargain-basement price they can’t believe their luck. Until the red-and-black dressed realtor explains that pesky ‘death in the house’ matter. As he puts it, ‘we’re talking about a little old lady who tripped down the stairs, and a husband who couldn’t go on without her.’ Ah, so now the Hellmans have a choice, to snap up a bargain, or stay put - but at what cost? And that’s the underlying theme of this film: the devil is indeed, as the saying goes, in the detail. What follows is nothing surprising or shocking. Of course the Hellmans move into the hell house. Ray shows up on their first evening asking to come back home. Jesse’s butterfly painting becomes increasingly disturbing (apparently the artworks featured in this were in fact painted by a bona-fide Satanist) and then some kid goes missing. However, the power of this film isn’t in its plot – it’s this amazing emotional reaction that you have to the characters. And that’s where The Devil’s Candy really wins. All the characters and the even crazy, child-murdering Ray are genuinely likeable. The plot is simple, but because you invest in these characters very early on, the real story comes from you, the viewer, and you realise quickly that you very much want all these characters to be alright. The Devil’s Candy doesn’t try to be anything else but a spooky horror movie with a killer soundtrack. Which in this day and age where filmmakers seem to increasingly want to out-do one another with brain jarring twists or just out and out violence, is a breath of fresh air. This film is special in that it is cinema in its purest form. It is made to be enjoyed, and much of the ride is what happens to you, as a person, as you watch. Which sounds simple, but how many horrors have you seen recently that can claim that, and still leave you smiling?